This is Part 4 of the IT Governance for Higher Education series of blog posts, based on the IT Governance Toolkit developed by Vantage Senior Consultant Cathy Bates for EDUCAUSE. Part 3: Give Focus and Meaningful Work to Your IT Governance Groups looks at the common pitfalls with the traditionally organized governance advisory role and provides a framework for a fresh approach that focuses on providing meaningful work and responsibilities to your governance committees. In this final post of the IT Governance series, we provide you with the tools to develop and implement IT Governance for your organization starting with launching a communication plan, syndicating the model and using a step-by-step implementation work plan to develop the model. You can also download the IT Governance Work Plan and IT Governance Questions and Needs Checklist from the links below. As you begin discussions with stakeholders about IT governance, it is a good idea to also launch a communication plan to keep your campus informed of your activities. An initial communication will introduce the goals, process and key stakeholders – and perhaps ask for early input. Later in the process, you will likely solicit additional input or feedback at various points. It is important to establish clear communication channels at the beginning of the project and to keep the campus community fully apprised while the model is being developed through a regular online newsletter or dedicated section on your website or intranet. Since the full scope of an IT governance initiative can seem overwhelming, consider phased approaches and pilot programs to break down the project into manageable portions. You may want to solicit ideas for how to do this as part of your vetting and communication steps. The benefits of a phased approach include the ability to focus support on one or two initial committees and the ability to get key processes working consistently before adding additional responsibilities. Create multiple opportunities to share the model and solicit input as you move from early concept to draft and a final design. As the governance design progresses, an open campus forum should be held on the draft model. The forum format allows the IT governance design team to interact with participants to explain the draft governance framework, get additional input, and solicit suggestions for committee participants. We suggest that you organize the forum to start with a short presentation on the framework and then allow participants to wander among stations staffed by members of your design team to provide feedback on key elements of the design or committee representations. This will foster individual conversations, which are often the best source of candid feedback. Consider setting up an easel with a stack of Post-it Notes at each station to facilitate feedback from participants. Finally, ensure that you document the feedback from all groups, distill the comments and insights into a working document, and share it with the campus community. As you settle on your final model, you may want to vet the plan with existing campus governance groups such as the cabinet, dean’s council, chairs council, faculty senate, staff senate, and student government. You can create a permanent bridge to these groups by including representation within the IT governance committees where appropriate. Ensure you have their support for the design and/or that you incorporate adjustments that may be needed as part of this vetting. Ask for suggestions for staffing the committees and how they want to receive communications about the committee work. Finally, prepare a general campus announcement to ensure that all campus groups know what will occur and why and how it will change current technology processes. To be fully transparent, you should also plan to outline your IT Governance structure and related information on your organization’s website. Having a work plan to steer you through the process of planning, designing, checking and implementing IT Governance function for your organization will keep you on track and make sure you did not leave out any important information. To facilitate this process, we created a one-page Work Plan for IT Governance that you can download and use as your guide. Plan – The first four tasks will help you Plan your processes and determine the steps, resources, barriers to address, risks, involvement and support necessary to get your IT Governance program off the ground. Design – You should design your governance model with a representative group of stakeholders as well as technology service owners. Talk with them about their needs and how they will be met with the design. Check – After you develop your preliminary model, you will want to check your governance model against what you wanted to accomplish with governance. Do you see where goals will be met? Do any gaps remain? Finalize the goals and publish them as part of the governance communication plan. Implement – The final 3 tasks will guide you to implement your plan with flexibility, agility, collaboration and transparency. You should also solicit ideas for who should be part of the committees. If you are considering a phased rollout, seek input on potential pilot committees and what governance responsibilities should be part of the initial phase. Download complete IT Governance Work Plan for Higher Education. 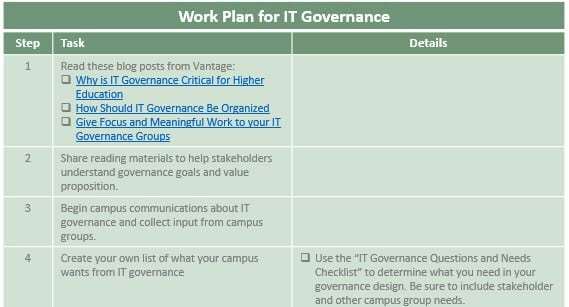 You can use this two-page Checklist of IT Governance Questions and Needs as the starting point for analyzing what your campus wants and needs from IT Governance as discussed in task #4 of the IT Governance Work Plan. Download complete IT Governance Questions and Needs Checklist for Higher Education. Cathy Bates, a Senior Consultant with Vantage Technology Consulting Group, has over 30 years’ experience in higher education focused on strategic planning, information security and IT governance. The IT Governance series of blog posts is based on the IT Governance Toolkit that Cathy developed for EDUCAUSE.